Oddly enough, despite the fact that he passed away in 1980 no one has yet written an English biography of Bengal’s first superstar till senior journalist Swapan Mullick took up the challenge posed by Tranquebar and tried to make sense of the legend and the madness. He starts with the rumour that crept round the shabby Tollygunge studios in the 1970’s that Uttam Kumar was leaving Calcutta for Mumbai and this time for good. Bengal’s superstar had yet to make his mark in Hindi films, mainly because his Hindi pronunciation left much to be desired and his voice was too well known to be dubbed. Mullick organizes Uttam Kumar’s life into various chapters that deal with his co-stars : Sabitri Chatterjee, Suchitra Sen, Supriya Devi who became his live in partner, his relationship with Satyajit Ray, who refused to use him in most of his films, barring Nayak which was based on the legend of a superstar and asked Uttam Kumar to delve into his darker side, influences from Hollywood for some of the films he acted in and his art compared to that of the other leading actors of the time. 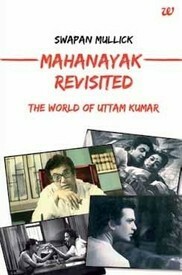 The book tries to understand what made Uttam Kumar such a star and the role he played in Bengali cinema. Mullick puts it down to the fact that the hero was quintessentially Bengali. He captured Bengali elegance in a spotless white dhoti and kurta, managed to be a knight in shining armour and an everyday hero at the same time. At the same time, he was an ‘instinctive’ actor who managed to get into the skin of the characters he portrayed, despite the absence of historical information he set the pattern for the way cinematic zamindars were supposed to act, for instance. After his death, Satyajit Ray went on record saying that while he, Ray, may have made directorial mistakes in Nayak, Uttam Kumar had made not a single mistake in acting. There are, of course, many things that Mullick does not have access to, or wisely chooses to avoid for the sake of forestalling controversy – for example the ‘unseen hands’ that ensured Uttam Kumar’s failure in Bollywood, which remains a whispered piece of gossip. Or the reason why one evening, he walked out on his wife and son to walk into a house in Moira Street and embark on a 17 year live in relationship – which was accepted by the whole of Bengal without comment or condemnation at a time when the superstar phenomenon was quite unknown. Or why he had a falling out with Tapan Sinha, one of the industry’s best regarded directors over the film Bancharamer Bagan. These are things that can only be guessed at and they tend to come round and round in the narrative. One would also wonder why there are no photographs of Sabitri Chatterjee or Suchitra Sen in the book, despite their important contribution to Uttam Kumar’s acting career. Uttam Kumar lived hard, practiced his roles at night, and died of a fourth heart attack out of sheer stress as he was acting in O go Bodhu Sundori, a film roughly based on My Fair Lady. He was deeply in debt because of Choti si Mulaqaat, the Hindi film he had insisted on producing himself, which had run overtime and failed at the box office. And his career too had taken on a downward curve even in the Bengali film world. But when he died he filled the hearts of his fans with a grief that few stars in Bengal have equalled. Despite certain flaws in the book, Swapan Mullick has captured the legend of a flawed man and great actor, very few of whose films have been considered worth preserving. One Comment on "Mahanayak Revisited: The World of Uttam Kumar"
A Bengali newspaper of recent time published that Uttam Kumar was booked for Bengali film ‘Bancharamer Bagan’ (in 1980s) directed by Tapan Sinha. Finally he was not taken into the film. He filed suit in (High) Court. Finally he lost the case. Is it a fact ?